Self-actualization books can be an addiction. You can get caught up in the joy of being seduced into believing that the untapped “potential” inside you is just sitting there waiting for some wise person to unlock the door for you. Self-help writers try to massage your head and marinate it in self-actualization juices that are supposed to help you reach your “full potential.” Many of the books they make are wordy, high-flying tomes that are a bargain by the pound. Right now I’ve got three little books sitting on my work-table. They are all less than 160 pages long. One is a fairly new book by a prolific author on leadership and success who is one of the top motivational speakers in the world. One is written by an inspired educator at Stanford University who introduced many students to the art of improvisational theater. The last, a book that is mostly pictures and artfully designed pages with large text, was co-written by two friends in 2010. At the time the book was written, one of them was a business management coach of some renown in Japan and the other a musician who worked in magazine publishing. I have a friend who swears that Brian Tracy changed her life. She was once an easy-going sort going nowhere slow. 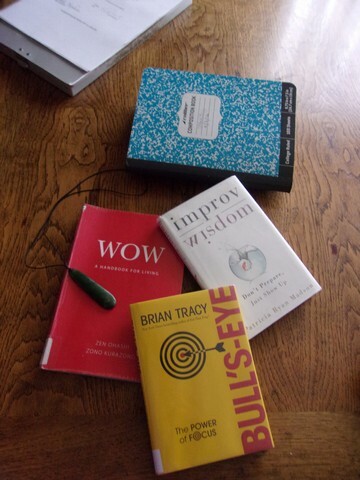 Tracy’s motivational books, she says, turned her head right around. Now she is calling out her shots and making them one after the other. All her wishes and daydreams have become goals, complete with plans on meticulously prioritized lists. She is either knocking off the targets she’s made for herself one after the other after the other or picking herself up from a stumble and moving on to the next plan. The girl is going for it; and she credits Tracy with her turn-around. The man’s been working in the fields of economics, history, business, philosophy and psychology for over 30 years now. He’s a top-selling author of over 70 books, translated into dozens of languages. His books are the business Bible on many folks’ shelves. Besides that, he’s produced hundreds of audio and video programs and has been a business consultant for more than 1,000 companies. Some of them have been among the biggest companies in the world. Tracy tells you that you can learn each of these skills through practice and repetition. Then he tells you how — step-by-step-by-step. This little book – just 100 pages long — is like a distillation of the business master’s long immersion in human development. It’s heady stuff. As are all of Tracy’s books, this one’s straightforward and full-speed-ahead. The year that Patricia Ryan Madson retired after four decades of teaching drama at Stanford University, she published a delightful book, IMPROV WISDOM, that basically tells us that since we’re making up life as we go along anyway, we might as well try to get good at improvisation and have a bit of fun along the way. Using the ways of improv as her guide, her whole way of moving through the world is based on NOT developing a script. No matter how well-designed our script may be, she points out, it starts unravelling when we interact with others who have scripts of their own. The result can develop into a duel of conflicting scripts that ends up in either a major blow-up and falling-apart or an unsatisfactory capitulation by one or the other leading to compromises that work for no one. Or, it can become the start of a new third thing that works for both…if there is spontaneity and flexibility and good will on both sides. In improvisational theater, the performers think on their feet. They accept everything their co-creators offer and they try to work with it, exploring options, capitalizing on and supporting each other’s moves in a grand effort to produce…a vaguely defined Something. Sometimes they succeed in producing a lovely bit of work and sometimes, not. There is joy in the effort, however, and beauty in the struggle. Madson points out that the addition of spontaneity to an ordinary, everyday life beats back the fearful grayness of spirit induced by our uncertain times. It can be used to add the color back into your life. In order to help you do that, she refined what she calls “the maxims” of improvisational theater to 13 simple strategies that can help you find a better way to deal with life’s challenges. If nothing else, her way of looking at the world is a beautiful kind of madness that finds the goodness in any situation and makes full use of whatever happens. All it takes is being willing to be completely present. The book began because Zen Ohashi, a Japanese business management coach, was asked to put together written material that would explain his methods for a company that was implementing his program and techniques. He had two weeks to do it and immediately suffered writer’s block. Nothing was coming out right. So, he got help. He called a friend, Zono Kurazono, a fellow member of his music band, to come and help him. Kurazono was a magazine editor as well as an active songwriter, singer and guitarist, so he was a good choice for the work. Ohashi described what he needed. Ohashi was thinking of a straight transcription job: Ohashi would talk about his method and Kurazono would write it down on paper exactly. For that, Ohashi offered to pay his friend $100. Kurazono came over right away carrying a large rolled-up piece of paper. Ohashi gave a 15-minute presentation of his method. Then Kurozono unrolled the two-foot by two-and-a-half foot Post-It note he was carrying and stuck it on a wall. The Post-It listed three levels of service. Ohashi went for the Executive level. The project took a year. During that time Ohashi broke down his methods into 31 techniques, each with its own exercise. Kurazono added pictures and massaged the typography until every page was an engaging bit of design. It was not boring, and the techniques were all tiny little steps and changes that made sense and seem easy to do (but are really not). Somewhere in that process, by the time the book was done, it had become more than a business technique manual. Ohashi’s techniques and exercises that helped people increase their productivity at work became tools and practices for addressing issues that might be holding back a person from having the kind of life he or she wanted. After it was done the friends decided to self-publish their manuscript. They thought that they might be able to sell it on the Internet. They took the manuscript to Kinko’s to be printed and bound. Their first customer was the girl who worked at Kinko’s. She fell in love with the book while she was putting it together. The new published authors left the print shop with 24 copies of their new book and their first $18. It went on from there. Apparently this is the only book these authors wrote. At least, it’s the only one that became an international phenomenon in its time. The book itself is deceptively simple. It’s an easily digestible, practical guide to ways that enhance communication, build relationships, and preserve emotional balance. The pictures are eye-catching and often have little to do with the words, but somehow they do work to help you retain the thoughts presented. It is a short read and, if you like the style, might have you going back to it again and again. It asks questions and presents novel ways of looking at assorted issues. It points fingers toward directions one could take when trying to deal with a challenging situation and it creates a process where you can find your own answers, often with the help of a friend. All of these books (like any other book in this genre) only work if you actually implement and consistently use the moves they lay out for you. If you don’t do the work, THEY don’t work. That’s just how it is. In any case, I must say, collecting insights is a good hobby and if you’re close to a decent public library, and you don’t go in for attending massively expensive conferences and get-togethers of like-minded beings, it’s even cheap. The insights do not take up a lot of space and they make great starter points for assorted writing projects, including Life-Built Poems. Who knows? You, too, might even get to be a blog-writer. Woo-hoo! You can see where you sit…. But it is not the time to dawdle. Until the thing’s dissolved into the light…. This could get to be a full-time job.